Leaf: generally 50--120(200) cm; stipe generally 1/5--1/2 blade, base scales +- 3(6) mm wide, ovate, those above proximal pinnae generally > 1 mm wide, persistent; blade lanceolate to narrow-elliptic, 1-pinnate; pinnae generally in 1 plane, 2--8(14) cm. Sporangia: indusium ciliate. Chromosomes: 2n=82. Ecology: Common. Wooded hillsides, shaded slopes, rarely cliffs, outcrops; Elevation: < 1600 m. Bioregional Distribution: NW, n SNF, n&s SNH, CW, n ChI, TR, MP (caves in Lava Beds National Monument); Distribution Outside California: to Alaska, Montana, South Dakota; also Guadalupe Island (Mexico). Note: Hybrids with Polystichum dudleyi are called Polystichum californicum. 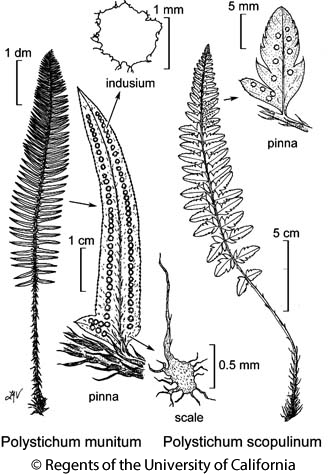 Citation for this treatment: Alan R. Smith 2012, Polystichum munitum, in Jepson Flora Project (eds.) Jepson eFlora, http://ucjeps.berkeley.edu/eflora/eflora_display.php?tid=39422, accessed on April 23, 2019. NW, n SNF, n&s SNH, CW, n ChI, TR, MP (caves in Lava Beds National Monument); Markers link to CCH specimen records. Yellow markers indicate records that may provide evidence for eFlora range revision or may have georeferencing or identification issues. Purple markers indicate specimens collected from a garden, greenhouse, or other non-wild location.